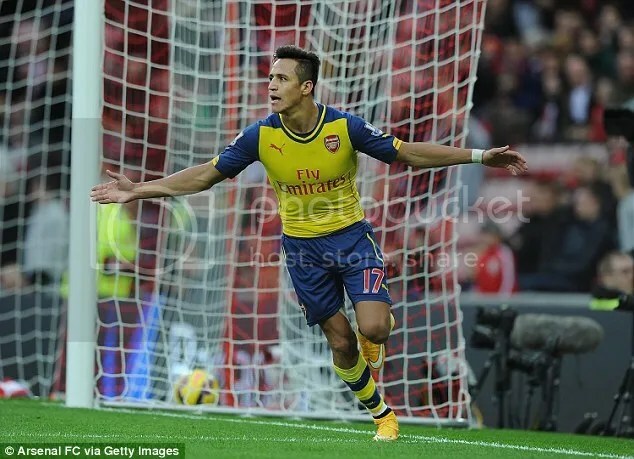 2014/15 Season: Sunderland 0-2 Arsenal – Move. Run. Sports. Sunderland were looking to bounce back after the 8-0 hammering by Southampton the week before, playing Arsenal was never going to be an easy task for the black cats. Arsenal could claim to be missing a massive nine first team players, but the starting line up was still very strong especially with Alexis Sanchez leading the line for the gunners. The game was pretty close early on, with both teams trying to build attacks. It took a mistake from Wes Brown for the opening goal and Sanchez really did finish in a fantastic way with a cheeky chip, a fantastic finish. His movement is something else and something which Sunderland struggled to deal with on the day it took until added time in the second half for Arsenal to add a second goal. Sunderland had made some changes but never looked like a threat towards the Arsenal goal. Which is something to be concerned about with the lack of goals so far this season, or not even just goals but chances being created. Which is a shame really as Sunderland do have some decent players in the squad, and up until last weekend had the fourth best defence in the league. Let’s hope Gus Poyet can change things around and I am sure more changes will be made for the next league outing. Theo Walcott was back on the bench for Arsenal but a used sub, this has to be a positive thing for Arsenal and I have to admit that I was rather excited to see him before the start of the game. Walcott is a player I rate very highly and I was gutted when injury put him out of the World Cup in the summer. I will be looking on to see his progress this season. Arsenal have always been a team I have enjoyed watching, thinking back to the Overmars/Bergkamp years when I was a kid! ‹ PreviousMy plan for this blog!